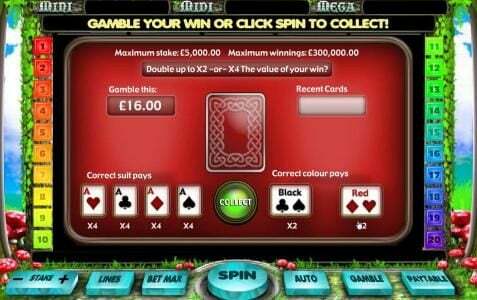 Slot review of Alice in Wonderland slot machine thought up by Open Bet software with 20 lines and 5 reels. Alice in Wonderland Slots has not been reviewed yet, be the first to rate this slot. 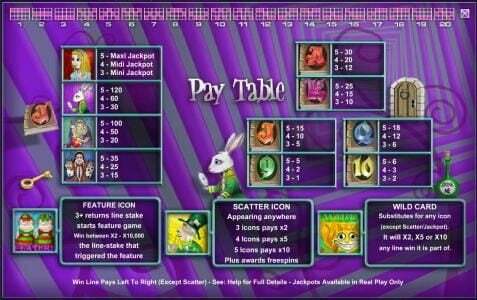 With Alice in Wonderland, OpenBet created a slot that has 5 reels, with 20 paylines, plus a $6,000 top jackpot. The game’s features, which include multipliers, scatters, Free Spins and wild symbols, should keep most people busy for quite a bit of time. 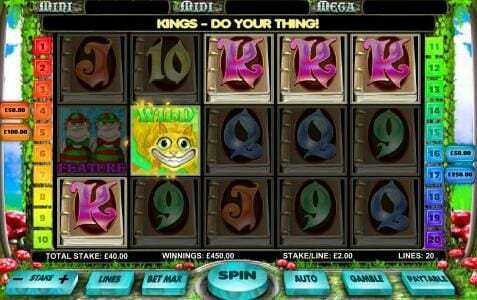 The fairy tale that has the same name as this slot is well known to most people, one of the stories we’ve all heard or read, while growing up. The game’s design is a bit low quality, though I’m not sure if it’s on purpose. It looks like the characters are hand drawn and then colored, which is not necessarily a bad things, just not something we’d expect to see in a slot. A very big part of the screen is occupied by the reels, so there isn’t much visible in the background. 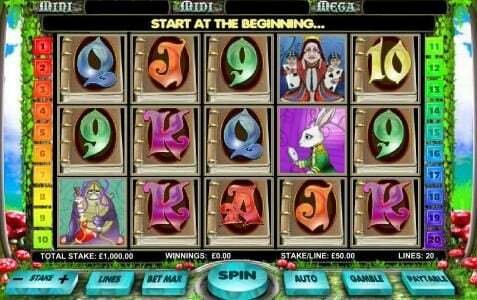 The symbols used in this slot use images with Alice, the Caterpillar, Red Queen, Tweedledee and Tweedledum, Mad Hatter, the Cheshire Cat and the playing card symbols, which start with Nine and go up to the Ace. Alice in Wonderland, despite the design, seems to be a high roller Slot, allowing for coin values to go as high as $50, with the maximum bet being $1,000. The coins can be as low as $0.25, so you can bet on all the paylines with as little as $5. The big prizes are progressive jackpots, so the game itself doesn’t offer that much. You get up to 120 coins from the highest paying symbol, which means up to $6,000. The bigger prizes available in the game are the progressive jackpots, and there are three of them. The Alice symbol awards them all, depending on how many of them are on the payline. With three Alice symbols you get the Mini Jackpot, with four you get the Midi Jackpot, while five will award the Maxi Jackpot, the biggest one. The game’s own prizes have the Rabbit symbol at the top, and it pays 120 coins if you have five of them. It can mean up to $6,000, if you’re using $50 coins. The twins are a feature icon, which trigger a Bonus round that has prizes between 2 and 10,000 coins. The scatter symbol will pay between 2x and 10x, and it will also give out spins for free, if you have a minimum of three symbols anywhere on the reels. The Cheshire cat is used as the wild, and it substitutes for various symbols, while multiplying their payouts, with a random value chosen between 2x, 5x and 10x. An entertaining game, with plenty of features, and progressive jackpots, but the graphics will not be to everyone’s liking.